I don’t usually write this much in a week for my two oldest regular clients (“oldest” being a relative term, since it’s been just over a year since my first post for Discovery), but the scheduling worked out that way. This critique of the FCC’s latest study of the U.S. residential broadband market might have gone up last week had I not set it aside to write about Reddit’s coverage of the Aurora shootings. Instead, I gave it another couple of days. 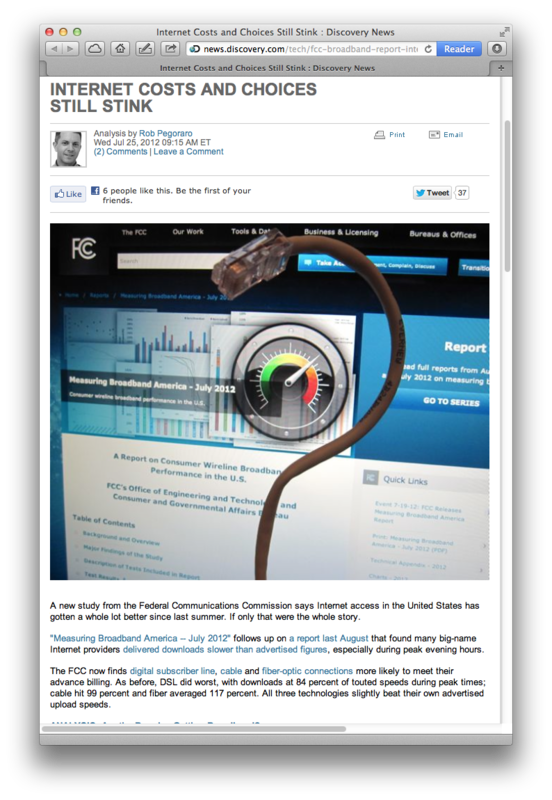 In that time, I came up with the somewhat contrived illustration shown here: an Ethernet cable twisted in the shape of a question mark in front of the FCC report as seen in a laptop’s browser. The headline here overstates things slightly–pricing for most consumer-grade connections doesn’t seem that bad, at least if you compare it to cable TV–but nobody can say the state of competition is good. I updated the post a day later to add a reference to Google’s just-announced pricing for its Kansas City fiber-optic service (1 billion bits per second for $70 a month, 1 Gbps plus a set of TV channels that exclude ESPN for $120, or 5 Mbps for free after a connection fee). As I mentioned upfront, it’s been just over a year since Discovery set out to cover tech and gadget news more closely. This photo gallery, featuring myself and the other regular Discovery contributors writing about gadgets we’ve appreciated more than most, marks that anniversary. This reassessment of the relative openness of a few key consumer-tech markets was going to be last week’s post for CEA–as you can see, it’s responding to Microsoft’s pulling out its MSNBC joint venture and Yahoo hiring Google’s Marissa Mayer as its new CEO–but got held up for various reasons. I’m not sure there was a solid 800-word blog post in this topic, but once I realized that I didn’t have time to crank out something different–I was late enough already. Here I question the move to make ever-thinner gadgets at the cost of connectivity, expandability, compatibility and repairability. I could have written it at any time over the last few months, but buying a MacBook Air laptop–and realizing how much more I had to think about its memory allocation when I couldn’t upgrade that later on–closed the deal for me. I feel better about Mountain Lion than I do about Lion–but I also recall that some of Lion’s annoyances took a few weeks to sink in. You’ll have to ask me in a month if I’m still spending much time checking the Notifications list, using the Share buttons in Safari and the Finder, or employing the Dictation feature to crank out short snippets of text. I also wonder if by then I will have figured out why the MacBook doesn’t see my Canon printer/scanner; nobody had an answer when I asked on Google+, and this post hasn’t generated any input on that subject either. Giving readers a refresher course in how smartphones fix their location through network signals, WiFi and GPS allowed me to bring orbital mechanics into an article, which doesn’t happen all that often. If I hadn’t written this a couple of weeks earlier (my editor was going on vacation), the second part of this column could also have noted the newfound interest of some U.S. Olympics viewers in using proxy servers to watch the BBC’s reportedly-excellent streaming video of the 2012 games. This entry was posted in Weekly output and tagged 10.8, antitrust, competition, favorite gadgets, FCC broadband study, FCC measuring broadband, Google fiber, GPS, IP address, location-based services, MacBook Air, Mountain Lion, nano-SIM, openness, proxy server, Ultrabook, WiFi by robpegoraro. Bookmark the permalink. Are we ready to foreclose on the idea of upgradable hardware? Yes, and no. I just bought (hasn’t been delivered yet) a new Mac, a Mini. Got it with 8GB Ram. Doubt that will ever seem too small. The 500GB HD might, but it has a LightSpeed port, so I can put lots of stuff on fast external hard drives. Frankly, my 24″ Mac Mini lasted almost 6 years before I outgrew it. We may finally have reached the point at which Moore’s Law, for most of us, is unimportant.